Coconut oil definitely belongs in the group of healthiest foods. Its unique combination of fatty acids can be significantly beneficial for your health. This amazing oil has a number of health benefits, including fat loss, better brain function, and many others. Coconut oil is one of the ingredients that have been demonized in the past because it contains saturated fat. Actually, coconut oil contains saturated fat with 90% of the fatty acids in it being saturated. Recent studies proved that these saturated fats are not harmful. Moreover, this oil does not contain the average saturated fats found in cheese or steak known as long-chain fatty acids. Coconut oil contains medium-chain fatty acids which are metabolized differently. They go straight to the liver from the digestive tract, where they are used as a quick source energy or turned into ketone bodies which have therapeutic effects on brain disorders including Alzheimer’s and epilepsy. Coconut is considered as “exotic” food in the Western world, mostly consumed by health conscious people. But, in some other parts of the world, coconut is considered as dietary staple consumed by many generations. For instance, Tokelauans, people who live in the South Pacific intake 60% of their calories from coconuts. These people are considered as one of the healthiest people, with no evidence of heart disease. Many people around the world suffer from obesity. Some think obesity is only a matter of calories, but in fact, the sources of those calories are critical too. Different foods can affect our body and hormones in different ways. So, a calorie is not a calorie. 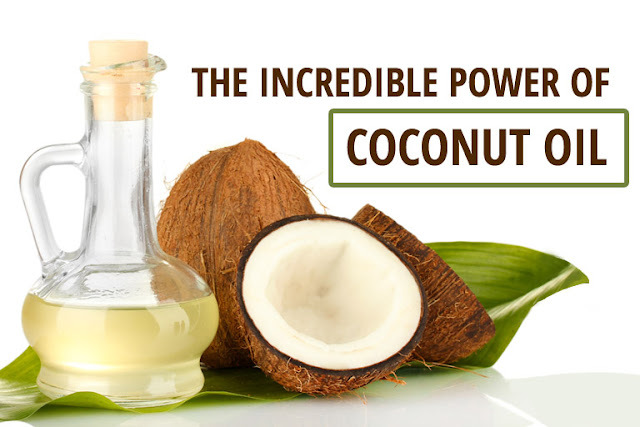 Coconut oil contains medium-chain triglycerides which can increase energy expenditure. A study proved that 15-30 grams of these medium-chain triglycerides can increase 24 hour energy expenditure by 5%. An interesting fact is that coconut oil can reduce your hunger. This is due to the way fatty acids in it are metabolized because ketone bodies have an ability to reduce your appetite. In one study, 6 healthy men consumed varying amounts of medium and long chain triglycerides. The men who consumed the most medium-chain triglycerides ate 256 fewer calories a day. Another study showed that men who ate the most medium-chain triglycerides at breakfast ate fewer calories at lunch. These studies were done for a short period of time, meaning that over the long term, coconut oil can have significant influence on body weight. A ketogenic diet is currently being studies to treat numerous disorders. This diet involves eating large amounts of fat and very little carbohydrates. It can significantly reduce the rate of seizures in children with epilepsy. This is because the medium-chain triglycerides go straight to the liver where they are turned into ketone bodies. Coconut oil is packed with saturated fats which are not harmful for the blood lipid profile. They raise the good cholesterol (HDL) and change the LDL cholesterol to a benign subtype. A study proved that coconut oil can reduce total and LDL cholesterol and increase HDL, which lead to a reduced risk of heart disease. Many people use coconut oil for cosmetic purposes. It can improve the health and appearance of your hair and skin. According to a study, coconut oil can improve the moisture and lipid content in people with dry skin. It can protect your hair from damage and ultraviolet rays. You can also use it as a mouthwash. It will kill the harmful bacteria in your mouth, reduce bad breath and improve your dental health. Alzheimer’s is the main cause of dementia which mostly occurs in elderly individuals. Alzheimer’s patients have a reduced ability to use glucose for energy in certain parts of their brain. Ketone bodies have the ability to supply the brain with energy, reduce symptoms of Alzheimer’s and provide an alternative energy source for these malfunctioning cells. According to a 2006 study, the regular consumption of medium-chain triglycerides can improve the brain function in patients with milder forms of Alzheimer’s. Taking in consideration that coconut oil can increase fat burning and reduce appetite, it is clear that it can help you lose weight. It is extremely effective in reducing abdominal fat, which lodges in the abdominal cavity and which is known as the most dangerous fat of all and it is closely related to many diseases. In one study, 40 women with abdominal obesity were given 30ml of coconut oil supplements on a daily basis. The results show that the experienced significant reduction in BMI and waist circumference in 12 weeks. Another study noted a reduction in waist circumference of 2.86 cm after 4 weeks of taking 30ml of coconut oil a day. Maybe this number will not seem too impressive at first, but you should know that these people were not exercising or restricting calories. They were losing abdominal fat just by adding coconut oil to their diet. Note: It is very important to use organic, virgin coconut oil. It is available in most health food stores!